Well, I’m moving along….slowly……the pastels above are numbers 12, 13, 14 & 15 in my quest to meet the 100 pastel challenge that started on a website (Wet Canvas) last year. The idea was to complete 100 identical (sort of) paintings, changing colors and exploring new choices. It started with a post by a woman who said that legend has it that you really don’t know a medium until you have completed at least 100 paintings using it. One very good point made during the discussions was that we sometimes get into a rut and reach for the same colors when painting similar subjects. The challenge was to complete the 100 using the same size and design (didn’t have to be a landscape as anything would work) and in a limited time, so you wouldn’t get picky …. just get those new, unfamiliar colors down and move on. We all started with an line (vine charcoal in most cases) drawing and decided what rules we would follow. 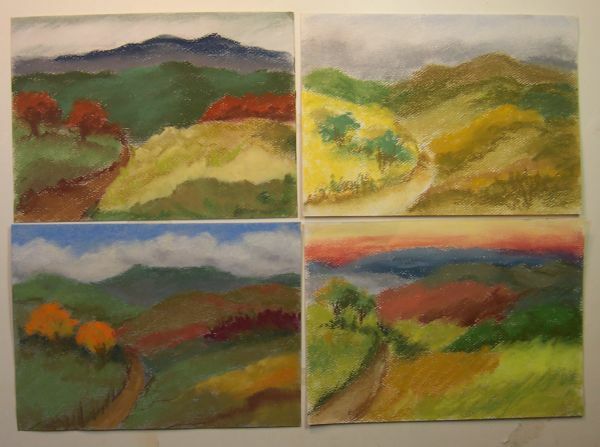 I chose 5″ X 7″, with no more than 30 minutes allowed for each painting. I really haven’t pushed myself to finish, turning to other projects as the muse whispered in my ear. But, hopefully I’ll complete this in 2011…at least that’s my new goal. At which time, I’ll post the entire 100 in a single shot. I’m thinking of eventually making a poster. This entry was posted on Monday, November 15th, 2010 at 3:04 pm	and is filed under 100 Pastel Challenge, Color, Landscapes, Paintings, Pastels. You can follow any responses to this entry through the RSS 2.0 feed. You can leave a response, or trackback from your own site. I think this is an amazing project. I’ve done similar stuff on a smaller scale, but the repitition is tough. The concept is sound though: by keeping subject and composition the same, you are forced to explore different morphologies within that framework without unwittingly changing your approach based on the subject matter. Excellent! I want to see martial landscapes! Since you’ve told me that you really meant “Martian” landscapes, you’ll have to give me some time…..perhaps I can find some pictures in the science websites…..
Well, you can see, I’m willing to try anything. Might start a whole new art movement.